UK: Macmillan, 2005. The First British Edition of this Inspector Banks title. Signed on the title page by the author. 359 pp . Signed by Author. First U.K. Edition. Hard Cover. Near Fine/Near Fine. NY: Scribner's, 1989. The First Edition of this early Inspector Banks title. Signed on the title page by the author. 273 pp . Signed by Author. First Edition. Hard Cover. Near Fine/Near Fine. NY: Scribner's, 1989. The First Edition of this early Inspector Banks title. Signed on the title page by the author. 317 pp . Signed by Author. First Edition. Hard Cover. Near Fine/Very Good ++. NY: Scribners, 1929. Bound in black cloth with gold labels. The labels are bright (virtually as new). The first edition of the book without the disclaimer, and the true first state dust jacket with price of $2.50 on front flap with "Katherine" on the front flap of the jacket and two reviews on the back panel. . The jacket has had some minor restoration work to top of spine. A beautiful copy. One of 31050 copies in the first printing. Reference: Hanneman 8.A.. First Edition. Hard Cover. Near Fine/Near Fine. NY: Scribner's, 1986. Bound in blue plastic covers, spiral bound. 497 pp., printed rectos only. Reproduced from the corrected typescript with editiorial changes reproduced. First leaf states, "Submission Book of the Month Club, Inc." Minor bumping to bottom out corners, otherwise Fine. Issued for consideration by the Book of the Month Club. Number prepared is unknown, but of a similar advance copy done for BOMC earler in the year -- there were only six made. This precedes the regular advance proof of this posthumous novel. It was accepted by the Book of the Month Club for publication. It shows final editorial changes (presumably by Scribner's). 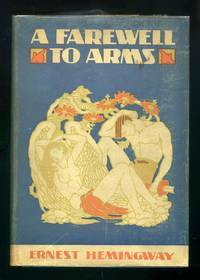 A scarce Hemingway collectible. . Advance Uncorrected Proof. Soft Cover. Near Fine/No Jacket. 4to - over 9¾" - 12" tall. Advance Copy. No Place: Fanwood Press, 1915. Ex-lib with usual markings. Pamphlet bound in Stiff Boards, with tape repair to front panel. The binding is tired, but the interior pages have held up well. Eight black and white photos on glossy stock. 24 pp. in total. Scarce in the first edition. . First Edition. Soft Cover. Good Only/No Jacket. 8vo - over 7¾" - 9¾" tall. NY: Knopf, 1979. An absolutely stunning set of the first U.S. edition of the five books that comprise this "set": Shikasta, The Marriages Between Zones Three, Four and Five, The Sirian Experiments, The Making of the Representative for Planet 8 and The Sentimental Agents. All housed in bright, matching dust jackets. . First Edition. Hard Cover. Fine/Fine. Cleveland: J.B. Savage, 1938. Just a light bit of scuffint to top edge of spine. Overall, a crisp, clean copy of this Hemingway limited first edition (#386 of 1000). This is the second issue with the plain brown endsheets. 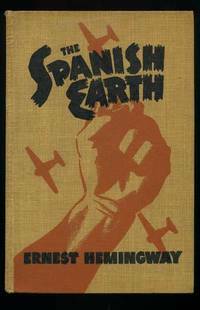 This book is the text of the narration that Hemingway contributed to the 1938 Joris Ivens film of the same name, a pro-Republican documentary about the Spanish Civil War. Introduction by Jasper Wood. 60 pp. With the disclaimer printed on the rear pastedown. . First Edition. Hard Cover. Near Fine/No Jacket. Illus. by Frederick K. Russell. New York: Bramhall House New Complete Edition, First Bramhall House edition; off-setting to front end-papers; introduction by Ernest Hemingway; 1072pp. A tight, clean copy in bright dust jacket. . First Thus. Hard Cover. VG+/VG++. New York: Frederick A. Praeger, Publishers, 1969. Taped repaired, price-clipped DW; previous owners inscription on ffep. ; color frontis. and 8 color plates; over 200 black & white photos; 164pp. The book is in very nice condition. The dust jacket is present, but lacking . . . . First Edition. Hard Cover. VG++/Good Only. New Haven: Yale University Press, 1920. The Chronicles of America Series, Volume 28; black & white tissue protected plates; t.e.g. ; a tight, clean copy in the original (scarce) dust jacket; 245pp.. Early Reprint. Hard Cover. Near Fine/VG+. New Haven: Yale University Press, 1921. The Chronicles of America Series, Volume 12; black & white tissue protected plates; fold-out maps; t.e.g. ; a tight, clean copy in the original (scarce) dust jacket; 295pp.. Early Reprint. Hard Cover. Near Fine/VG+. LA: United Artists, 1973. A beautiful set of the complete run of Lobby Cards for the release of this movie that starred Sean Connery. Contains all eight original lobby cards with the numbers "73/192" written on the bottom right of each card. This movie starred Sean Connery as Detective-Sergeant Johnson. Scans upon request. . First Edition. Near Fine/No Jacket -- As Published. 11" X 14". New Haven: Yale University Press, 1920. The Chronicles of America Series, Volume 46; black & white tissue protected plates; t.e.g. ; a tight, clean copy in the original (scarce) dust jacket; 305pp.. Early Reprint. Hard Cover. Near Fine/VG+. New Haven: Yale University Press, 1920. The Chronicles of America Series, Volume 17; black & white tissue protected plates; fold-out map; t.e.g. ; a tight, clean copy in the original (scarce) dust jacket; 235pp.. Early Reprint. Hard Cover. VG++/VG+. New Haven: Yale University Press, 1920. The Chronicles of America Series, Volume 45; black & white tissue protected plates; t.e.g. ; a tight, clean copy in the original (scarce) dust jacket; 215pp.. Early Reprint. Hard Cover. VG++/VG++. New Haven: Yale University Press, 1920. The Chronicles of America Series, Volume 40; black & white tissue protected plates; t.e.g. ; a tight, clean copy in the original (scarce) dust jacket; 279pp.. Early Reprint. Hard Cover. Near Fine/VG++. New Haven: Yale University Press, 1920. The Chronicles of America Series, Volume 42; black & white tissue protected plates; t.e.g. ; a tight, clean copy in the original (scarce) dust jacket; 250pp.. Early Reprint. Hard Cover. Near Fine/Near Fine. New Haven: Yale University Press, 1920. The Chronicles of America Series, Volume 21; black & white tissue protected plates; t.e.g. ; a tight, clean copy in the original (scarce) dust jacket; 211pp.. Early Reprint. Hard Cover. Near Fine/VG++.